Hydrogen is number one on the periodic table. It’s the simplest, lightest, most abundant element in the universe, with just one proton and one electron. But even the unassuming element has its mysteries. One of the mysteries revolves around a 1935 prediction by physicists Eugene Wigner and Hillard Bell Huntington that hydrogen can become metallic at low temperatures under extremely high pressures. Hydrogen is usually a gas, but at low temperatures it becomes a solid. Solid metallic hydrogen would be an electrical conductor like copper or aluminum. The pursuit of metallic hydrogen has captivated scientists for eighty years. Not only because of their curiosity to understand how this simple atom behaves in its condensed matter form, but also because it could lead to revolutionary applications like superconductivity at room temperature and extremely powerful rocket fuel, as well as a better understanding of giant, gaseous planets like Jupiter that are composed primarily of hydrogen and helium. Despite energetic efforts, metallic hydrogen in solid form has remained elusive. The pressure necessary to create metallic hydrogen, if it can be done, turns out to be much higher than Wigner and Huntington predicted. To-date, hydrogen has been exposed to pressures over four million times that of the Earth’s atmosphere, the highest we can currently reach in a lab. Earlier this month, a team of Harvard University physicists led by Isaac Silvera announced findings in Physical Review Letters from an experiment that exposed a type of hydrogen known as hydrogen deuteride (HD), to pressures up to 3.4 million atmospheres. This is the highest pressure at which HD has been studied. They observed two new phases at low temperatures that haven’t been seen before in other types of hydrogen. Although the hydrogen is not metallic in these phases, they provide new insights into how hydrogen responds to extremely high pressures. Hydrogen has three isotopes, and HD is a compound of two of them – protium (H) and deuterium (D). In order to see what happens to HD at extremely high pressures, the team put a small sample of HD gas in a cooled diamond anvil cell. A diamond anvil cell is a device that essentially squeezes a sample between two diamond tips. While the sample was being compressed, the researchers sent infrared light through it and looked at the light signal that emerged from the other side. An illustration of hydrogen deuteride (in the yellow box) compressed in a diamond anvil cell. Different types of molecules and atoms absorb light in signature ways. By analyzing the light signals that emerged over a range of pressures and temperatures, the team explored how their sample changed with these variables. At low temperatures and high pressure, they saw evidence of something which hadn’t been seen before, but which is allowed by theory. The light signal showed that HD was a stable molecule up to a pressure of about 2 million atmospheres. Beyond this point, however, the sample became a mixture of HD, H molecules, and D molecules. This indicates that at significantly high pressures, HD molecules rapidly break apart and recombine with their neighbors into new molecules of any of the three types. 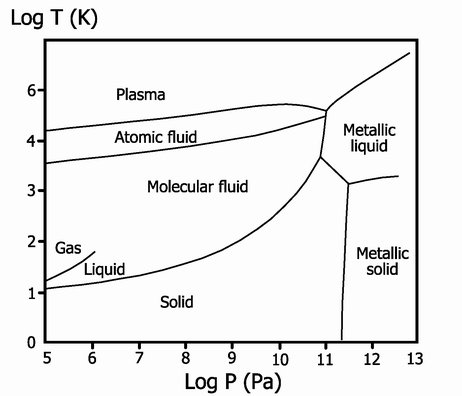 Previous experiments with samples of pure H or D at this pressure and temperature had not illuminated this process. The key was performing the experiment with HD so that the atoms could recombine into HD, H, and D molecules—different types of molecules that could be distinguished by their light signals. A sample of pure H or D before and just after the 2 million atmospheres mark wouldn’t look any different since all of the atoms would recombine into the same type of hydrogen that you started with. By analyzing the light signals, the team found two new phase transitions for HD, regions of temperature and pressure where the signal indicates a significant change in structure of the HD solid. If the sample had become metallic, the team would have seen evidence of the HD molecules breaking apart into individual H and D atoms. They didn’t see this, but the new phases provide important insight into the physics of what happens in hydrogen at high pressures and low temperatures. These findings add key details to the hydrogen phase diagram, which is a kind of map that illustrates how hydrogen behaves under a range of pressures and temperatures. As high pressure techniques improve and the search for solid metallic hydrogen continues, this map will guide the development of future predictions and experiments.